Next to the giant Minyé sinkhole another well known giant hole in Nakanai Mountains is Naré sinkhole. Below it there is flowing one of the most powerful underground rivers of the world. The exotic island of New Britain has many natural wonders – volcanoes, geysers, numerous endemic animals and plants. But unsurpassed wonders hide in Nakanaï Mountains – up to 2,185 m high mountains in central-eastern part of the island. Total area of these mountains is 5,500 km². Equatorial climate leads to nearly constant rain in the central part of Nakanai, helping to sustain a dense cover of rainforest. Even nearly vertical cliff faces here are covered with dense jungle. Intense biochemical processes in the soil of rainforest create lots of humic acid. At the sea the precipitation is some 6,000 mm per year, but up in the mountains it reaches 10,000 – 12,000 mm per year. Thus this location is one of the wettest in the world next to such well known "wettest places of the world" as Cherapunji in India and Mount Waialeale in Hawai’i. Nakanai mountains consist of thick (up to 1.5 km) layer of Miocene limestone, Yalam formation. It is covered with fine Pliocene volcanic deposits. Volcanic deposits have been eroded, giving a possibility for karst processes to develop. Geological structure, heavy rain and abundant humic acid from rainforest cause intense karst processes here – possibly the most intense in the world. Process happening here in a way could be called – "hyperkarst", because the usual factors causing the karst processes here have been pushed to their extreme. These processes are made even faster by one of the fastest tectonic uplifts in the world (3 mm per year) taking place in this area of New Britain. Troughout the last 200,000 years in Nakanai Mountains have formed eight giant canyons with depth reaching 600 – 1,000 m. Upper reaches of these canyons and their side ravines contain some of the most powerful springs in the world – sometimes starting as large waterfalls starting from the caves. So – these by far are not common rivers: upper parts of these rivers are located deep under the limestone, in giant caves. In some places in these caves formed enormous voids, which after some time collapsed. These collapsed voids are like giant holes with underground rivers deep below crossing their bottoms. In Nakanai mountains have been found numerous such sinkholes (also called collapse dolines and – if they are REALLY large and with vertical walls – tiankengs) – some have just opened and represent a narrow opening above giant underground voids. Others represent giant wells with vertical walls and others have degraded – they just resemble enormous, jungle covered depressions. Sinkholes of Nakanai Mountains belong to the most impressive, "best" sinkholes of the world. Naré sinkhole is one of the visually most impressive sinkholes here. Naré sinkhole looks like a giant hole in the green jungle. This hole is nearly round, 150 m long and 120 m wide. Depth of sinkhole is 240 – 310 m, volume is 4.7 million m³. Walls of the sinkhole are vertical and even overhanging – thus they are not covered with jungle. Below, at the bottom of sinkhole though is a patch of rainforest. Temperature in sinkhole is above 30°C and humidity is very high. At certain conditions though the air in sinkhole is somewhat cooler than outside and there form thick clouds at the upper part of this weird, giant hole. 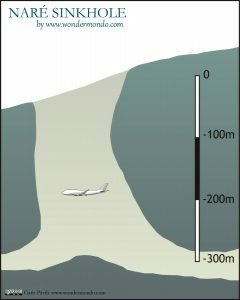 All of the limestone, which earlier filled the present hole, has been washed down the mountains by subterranean river, named Vaisseau Fantôme river (Flying Dutchman river), flowing across the bottom of sinkhole. Volume of this river is some 15 – 20 m³, while after heavy rains the discharge can be even 50 times higher. French explorers descended into this hole in 1978 and 1980, exploring cave passages up to 2 km length. British speleologists continued their work in 1986. Naré caves belong to technically most difficult caves to explore. Mighty subterranean river here is extremely loud – the noise in cave passages is like standing next to reactive airplane and there are needed special earplugs to endure this exploration. Local communities see a possibility to earn money from expeditions willing to visit Naré, asking even 6,000 EUR equivalent. From one side this might seem ridiculous, as explorers have spent a wealth just to come here and to install the necessary equipment. From the other side – this might be a beginning to a deal between local people and outsiders. Everyone should be interested to keep this natural wonder possibly intact – and good price for visit to it would deter casual people, while for local people this would show the true value of virgin nature. Waltham T. Tiankengs of the world, outside China, Speleogenesis.info. Accessed 24.07.10. Untamed River Expedition 1984 by Dave Clucas. Accessed 25.07.10.